After more than 20 years in practice, my work focuses on methods based on osteopathic principles (structural integration, craniosacral, and visceral manipulation -- descriptions below). Taken together, these methods aim to balance the alignment and mobility of the muscles, bones and organs, and create greater client awareness of health and well-being. Depending on the needs of each client, I adapt the methods I use to create lasting changes; my work is more oriented to problem-solving and client education than to on-going maintenance or general massage. For infants and children under 12, please email lauren@craftedtouch.com. Teens and adults: $120/hour; appointments also available at 45 or 30 minutes (at a prorated fee). Initial sessions generally last one hour. On-going care often requires 30 minute sessions; fees are prorated based on the time we use. A gentle method that seeks to balance the function of the central nervous system and to relieve stress as a major contributor to chronic pain, skeletal imbalance, and many common ailments (headaches, sleep or digestive problems, cognitive problems, and recent shock or trauma anywhere in the body). It may also involve mobilization of the many delicate structures in the cranium, face and jaw. A fascial approach to balancing skeletal alignment that usually is conducted in a set number of sessions or 'series' (often 3-4, 6-7, or 12). Fascia is the body's organizing tissue; it wraps the muscles, bones and organs and creates tendons and ligaments. Fascia is meant to distribute strain evenly, when we stand, sit or move. Unfortunately, through trauma, injury or daily habits, the fascia can become tight, short or sticky, not allowing for balanced or easy movement. This method frees and lengthens the fascia to restore alignment and ease. A gentle, yet deep way of releasing the organs, fascially and neurologically, to help them function well. We often don't realize the major role that the organs, blood vessels and nerves play in how our body is organized. Infections, surgeries, traumas - such as whiplash or falls, and even chronic postural problems can effect how well our organs move. This work aims to balance the mechanical strains on the organs, and return the tissue to a balanced position and function. Just as our bodies are subject to external stressors, we are subject to internal stressors: how we manage our emotions, thoughts and beliefs. With the body as our anchor and guide, the above methods may be applied as an exploration of the meaning, emotions or beliefs that can underly chronic stress or areas of injury. Working the muscles and soft tissue that hold the jaw is an important part of creating balance for the neck and head. Most people hold some amount of tension in the jaw muscles, and are often surprised how much more relaxed they feel after receiving this work. Techniques are applied to the neck, throat, outer jaw and within the mouth; the overall goal is to improve pain-free range of motion, release emotional or muscular tension, and improve the alignment of the jaw, neck and head. This work is particularly useful for people of all ages who are undergoing significant dental work, have chronic headaches or whiplash, and who have digestive problems. Newborns, toddlers and children are subject to many stressors, such as the birthing process, falls from learning to walk or sports, and common childhood illnesses (chronic ear/sinus infections, allergies, reflux, or cholic). Also, they are subject to many of the same stressors that adults are: car accidents, poor postural or movement habits, and emotional overwhelm. My work offers gentle intervention in a relaxed atmosphere. This work uses gentle touch and movement techniques to release tension patterns in the cranium, skeletal system, organs and other soft tissue (muscles/tendons). Usually, the first visit lasts an hour and includes discussion with mother (and/or father) about the pregnancy, labor and early experiences for the child. After getting a sense of the parent's concerns and doing some gentle assessments, the treatment is usually takes about 35 minutes of the hour. I only work to the degree that the child is able to receive, and can pause the treatment if the child needs soothing, feeding or changing (infants) or a break to play and integrate the treatment (toddlers and older children). As compared to chiropractic, my work does look at alignment and movement of the bones, but does not use quick forceful adjustments. I work with the inherent movement that is available already in the child, and follow/guide their movement toward greater ease and balance. At any point in the session, I'm happy to explain to you what I'm feeling and doing, so that you can be confident in the care your child's receiving. During the first visit, I ask that clients complete a full health history, which I will discuss with you along with your goals for treatment. First sessions generally run an hour, including assessment and treatment. If, for some reason, we do not need the full 60 minutes (as is often the case for follow up visits with children, or adults toward the end of their treatment cycle), my fee is prorated so that you are charged only for the time we use. Licensed Massage Therapist (LMT), Washington State, since 1994. KMI-Structural Integration, with Thomas Myers, Kinesis, 2004. I received my initial training at the Brian Utting School of Massage in Seattle in 1993-4. After graduation, I stayed on at the school as a teacher trainee and program manager. The early years of my practice were spent balancing a private practice and growing responsibilities at the massage school. For over 8 years, I was a core faculty member and Dean of Students and, later also served as the Dean of Faculty and Acting Director. Working within that community was an incredibly rich experience for me, and continues to inform my teaching and massage practice. Early on, my practice was fairly general; I was eager to work with as many people as possible, gaining experience in various settings: chiropractic clinic, gym, massage clinic, out calls, etc. One focus I had early on, was working with people at the end stage of their lives; as a volunteer, I massaged people with AIDS at a local hospice. This work was incredibly gratifying and taught me many key lessons about tending the whole person, not the just their symptoms or their disease, and that sometimes, even the smallest changes can make a big difference in people's quality of life. In 1995, I began studying craniosacral (biomechanical and later biodynamic), visceral manipulation and pediatric work with my mentor, Bruno Ducoux, DO. The gentleness and depth of this work appealed to me immediately, and soon I was assisting Bruno in his classes. During this time, I was also assisting Catherin Maxwell, ND in her Deep Muscle Therapy classes. These courses explored the balance between our anatomical 'engineering' and the emotional and spiritual dimension of structural bodywork. Looking back, I can see that I began a deeper cycle of learning in 1999, with the decision to pursue certification in each of my specialties. Although I had been practicing these methods for some time, I wanted a more comprehensive understanding of each method on its own terms, and importantly, how they related to each other. From 1999-2004, I completed a certification program in craniosacral work (biomechanical and biodynamic) with Ursula Popp, LAc, and assisted in her classes for several years. From 2003-2004, I completed a certification in Structural Integration (KMI) with Thomas Myers, author of Anatomy Trains. From 2005-2009, I have completed the coursework for certification in Visceral Manipulation through the Barral Institute. From 2010 forward, my continuing education has focused on neural manipulation, a gentle method that frees the nerves using osteopathic methods. Since that time, my teaching life has also blossomed. In 2005, I became a Certified Teacher of Kinesis and taught Thomas Myers' coursework in the Northwest, East Coast and in Europe from 2005-2013. In 2008, Richard and I began developing our own classes. Teaching is a wonderful complement to my practice, consistently refreshing and clarifying my skills and understanding. "As a practitioner, Lauren is compassionate, adept and intuitive. 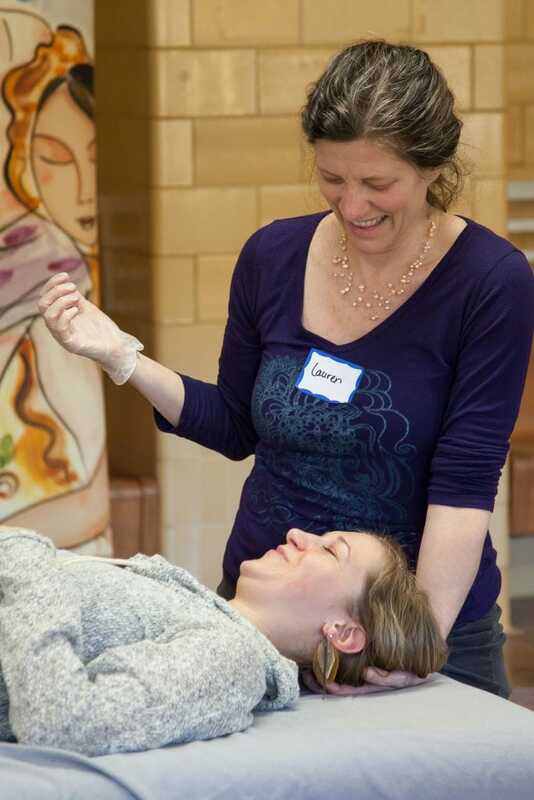 Her palpation skills are honed and impressive; she listens with her hands and her heart in equal measure, which allows clients to feel fully held in a place of true healing." — Patricia H.